Replay Media Catcher is widely used by many online video enthusiasts, which is the great convenience for many users. Especially on Windows OS, Replay Media Catcher has powerful video download features and extensive web site support. However, compared to its Windows version, Replay Media Catcher for Mac is much less impressive. With very few web sites supporting and unsatisfactory download quality, Replay Media Catcher for Mac has plagued many Apple users. For this reason, if you prefer a better downloading experience, Replay Media Catcher Mac Alternative is necessary so that you can get more reliable and high-quality videos. Luckily, there are other options available out there proving to be a better Replay Media Catcher for Mac alternative. Read on and get the best solution. Part 1: What is Replay Media Catcher? We can learn from the official website of the Replay Media Catcher, it is a powerful, convenient online video downloader as well as an audio/Mp3 recorder which can support more than 100 websites like YouTube, Myspace, and Vimeo and so on. Nevertheless, every bean has its black, although Replay Media Catcher has powerful features on Windows, it’s not as good on the Mac. A high price that doesn’t fit with its functionality is another reason I don’t recommend Replay Media Catcher for Mac. That is to say you can cost similar or even lower to use better software that is more suited to the Mac OS. But it is not easy to find a software that good enough to work as a Replay Media Catcher Mac alternative, that’s the reason why I write this post so that you can get reasonable advice to choose alternative to Replay Media Catcher Mac. 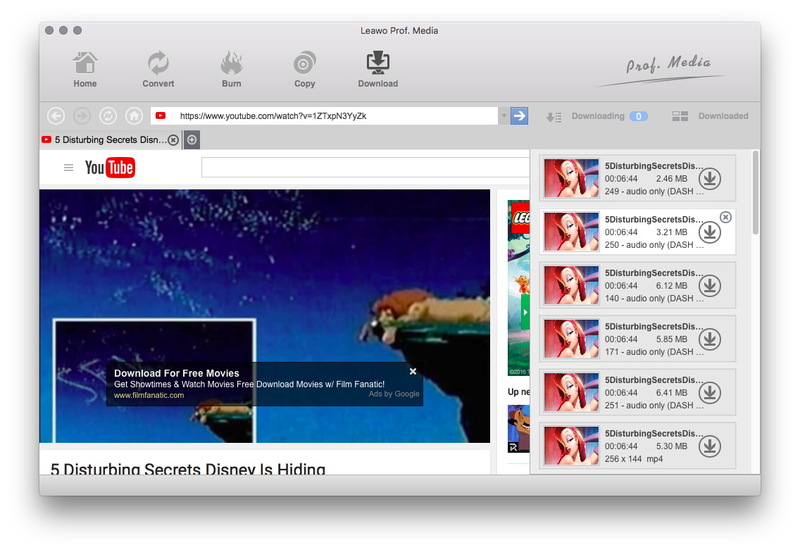 The first Replay Media Catcher Mac alternative I’m going to introduce is Leawo Video Downloader for Mac, the top video downloader around the world, which can download videos from more than 1000 sites like YouTube, Myspace, and Vimeo and so on. As a top-of-the-line video downloader, Leawo Video Downloader for Mac has powerful download ability and the fastest download speed. Due to its simple operation interface you can easily enjoy all the powerful and reliable features it brings to you. You can use Leawo Video Downloader for Mac to edit the video such as cutting out the parts you don’t like or adding subtitle for it. So I think Leawo Video Downloader is the best choice for you to choose as the Replay Media Catcher Mac Alternative. Part 3: Guide to download video with Leawo Video Downloader. 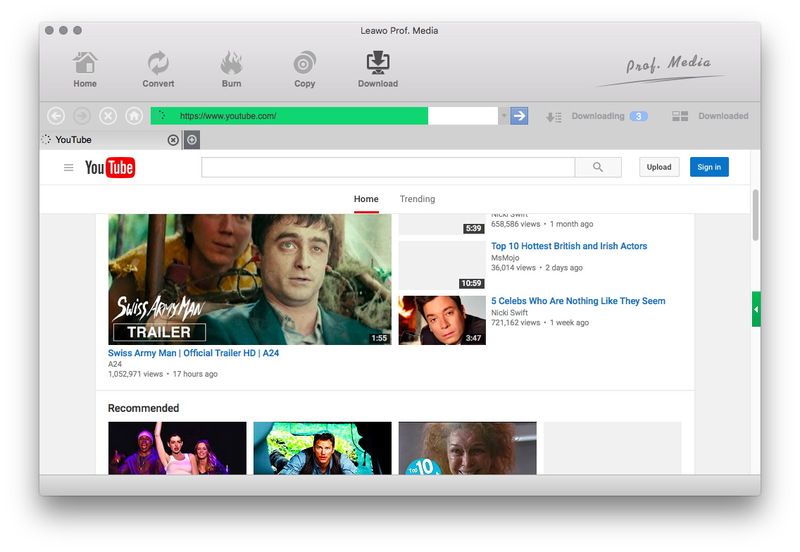 After a brief introduction to the Leawo Video Downloader for Mac, now in this part I will show you the detail steps about how to use Lewao Video Downloader for Mac to download videos from the Internet. First of all you need to paste video URL in the address box so that Leawo Video Downloader can directly detect the video for you. Click the download button to start downloading. You can choose the different resolution for the video to download. The video you choose will be downloaded immediately. After the download is complete, you can manage your downloaded videos by clicking the “Downloaded” button. You can arrange them by name, date, size, or length. Also, you can delete them or open the file location as well. In addition to Leawo Video Downloader, I have found three other good software for you. Although they are not as useful as Leawo Video Downlaoder for Mac in some features, as the alternative to Replay Media Catcher I think they are good enough to meet most of your needs. Just like Leawo Video Downloader for Mac, KeepVid Video Downlaoder for Mac is also a professional downloader which is also a good choice to download videos from the web such as YouTube, DailyMotion, Metacafe and Vimeo. And it can not only download videos as-is in MP4, 3GP, FLV, WebM formats, but also download videos on any other format with just one click. Total Video Downloader for Mac is a professional software for downloading videos in multiple formats. You can use it to save videos from the most popular websites with the click of a button and multiple embedded file types are supported. In addition, it can also enable you to download videos in batches if desired. All that is required is for you to copy and paste the URL from your browser into the field within the software. The third one I want to introduce to you is savevideo.me, an online free video downloader, which can easily download from Dailymotion, Facebook, Vimeo, Ustream, Twitter, Vine, LiveLeak, Aol.On, Streamable.com, Break.com, Rumble.com and other popular video service. You just need to copy the URL from the page and paste into the search box to download the videos without downloading and installing the software program. If you prefer to download videos online, savevideo.me will be a better choice to work as an Alternative to Replay Media Catcher Mac. It’s not difficult to see that Leawo Video Downloader for Mac can do this job well without any complex procedure. Compared to other Replay Media Catcher for Mac alternatives, Leawo Video Downloader for Mac has more faster downloading speed and better video quality. In my opinion, for a more comprehensive and high-quality download service, choosing Leawo Video Downloader for Mac is more accurate than use other downloaders. If you need, you can use it to download YouTube video for your iPhone easily.